The next logical progression up from a 9-particle Rishon (3x3) is a 15 particle frame (5 set of 3). However the number of legitimate (stable) combinations is extremely limited. These two ultra-quarks are effectively a pair of neutral pions rotating about a central quark. 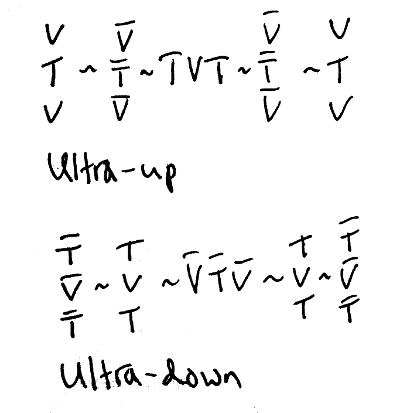 The neutral pions therefore give these ultra-quarks zero spin characteristics. Any particle constructed from them would therefore also have zero spin. The 15-Rishon ultra-quarks have been tentatively identified as the make-up of W, Z and Higgs Bosons. 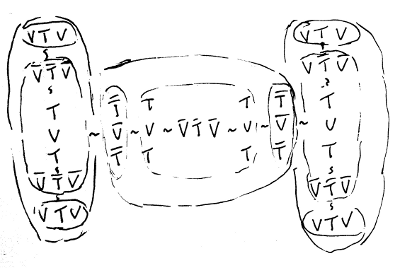 In a similar way to the Muon (as a 3x3 arrangement of T and anti-T particles) the tau is tentatively identified as being a lepton made out of entirely T and anti-T Rishons in a 3x 5x3 arrangement. Note the central quarks of each of the three ultra-quarks are those of a proton. A Higgs-0 (ultra-heavy neutron) should therefore also exist.